← Have a Ball in a Sphere! The very first climbing shoe I ever bought was a La Sportiva shoe. It lasted me about 4 years before finally giving up the ghost and I climbed hard on those shoes – almost every weekday. I have the utmost respect for the La Sportiva brand as a quality, long lasting shoe even though they might not be the biggest. It’s been a good 10 years since I last tried a climb with a La Sportiva shoe and even putting the nostalgia of the experience aside I wasn’t disappointed. The very first thing I always look at is how easy it is to get the shoe on – some are remarkably difficult and time consuming but the La Sportiva Tarantula slips on easily thanks to its laces free design. The way the fastening system works is very clever too – it fit well onto my wide feet thanks to a well thought out adjustment method which features opposite side locking straps that can move up and down as well as to tighten and loosen. The La Sportiva Tarantula is made of leather upper and mounded very well around my feet. The leather is unlined so it can get a bit hot inside the shoe after extended wearing but nothing at all unmanageable. La Sportiva’s FriXion rubber soles worked very well against the rock too with very little slip in the sole which is alarmingly sticky. The front hook isn’t very long however, which means that slightly more technically difficult routes might be challenging in the La Sportiva Tarantula Climbing Shoe. The same can’t be said for the heel, which had me looking for places to heel hook purely because of how well this shoe handled it. La Sportiva aren’t often associated with high end shoes and as such they market the shoe to beginner climbers looking at pushing themselves on higher grade climbs and with a price tag of around $88 US, it’s priced in the midrange price bracket– a good place to position when you’re aiming your shoe at beginners. 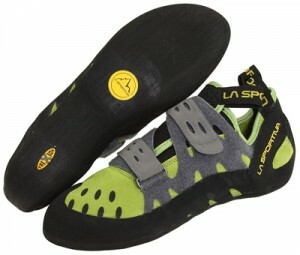 The La Sportiva Tarantula is attractive to look at too, with a light green (they call it Kiwi) and grey finish. 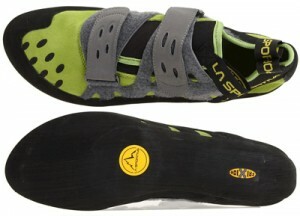 I really wanted to love the La Sportiva Tarantula. I wanted to never need another shoe again and keep climbing with it every time I went out to the crags. It looks great and it’s comfortable to wear with your toes at a half-curl. The truth is that the La Sportiva Tarantula Climbing shoe is a great choice for beginners and intermediate climbers but advanced climbers might find the lack of longer hook to be a hindrance. The shoe performs well for both trad and sport climbing and is at home in the gym too. If you’re starting out or progressing up route difficulties, then the La Sportiva Tarantula is a shoe that gets my nod of approval. If you’re an advanced climber looking for a shoe that might provide more technical reliability, you should have a look at the La Sportiva Python rock climbing shoe – but definitely stick to the Tarantula if you’re a beginner – it’s designed for you. This entry was posted in La Sportiva, Reviews, Rock Climbing, Shoes and tagged Climbing Equipment, Climbing Shoes, La Sportiva, Rock Climbing Shoes. Bookmark the permalink.